"Kupchan's magisterial accomplishment, drawing on an extraordinary range of theories and cases, is to provide an overarching account of when and why countries in conflict move toward stable peace. . . This book will be read by scholars and policy thinkers for a very long time." The bloodshed in Syria, the building confrontation over Iran's nuclear program, the territorial dispute between Israelis and Palestinians - these and many other clashes seem to underscore diplomacy's limited ability to resolve major international challenges. Time and again, such disputes befuddle even the most talented negotiators. Intractable rivalries certainly abound, but they should not be allowed to besmirch diplomacy's good name. Confrontation and conflict tend to grab the headlines, in part because they make for good reading. But behind the scenes, engagement between adversaries regularly succeeds in turning enmity into amity and, in so doing, advances the cause of fashioning a more peaceful and benign world. President Obama understands as much, one of the main reasons that he came to office committed to reaching out to adversaries. In his inaugural address, Obama informed those regimes "on the wrong side of history" that the United States "will extend a hand if you are willing to unclench your fist." Despite persistent claims from Republican opponents that engagement with adversaries is tantamount to appeasement, Obama has stuck to his guns. And he has much to show for his efforts. Washington's "reset" with Moscow has produced U.S.-Russian cooperation on downsizing nuclear arsenals, stabilizing Afghanistan, and isolating Iran. America's outreach to Myanmar has helped advance the fortunes of political liberalization there. Dialogue between Washington and Havana has proceeded fitfully, but it has nonetheless helped encourage Cuba to begin privatizing its economy and to free some of its political prisoners. More recently, the United States and North Korea struck a tentative deal in which Pyongyang would curb its nuclear program in return for food aid. To be sure, all of these openings are tentative and reversals may well be in the offing. But rapprochement always advances slowly and unevenly. Mutual accommodation is the first step; gestures of good will help mute rivalry. Reciprocity and deepening links between the parties then help lay a foundation for greater trust and cooperation. The process ends in the realm of identity. Former adversaries jointly construct and propagate a narrative of community and friendship that deepens peace. These steps require not just tactful diplomacy, but also careful management of politics on the home front. When a leader reaches out to an adversary, domestic opponents almost always mount nationalist attacks. As Obama has found out when doing business with Moscow or pursuing dialogue with Tehran, the domestic politics of engagement are at least as treacherous as the diplomacy. Conservative commentator Michelle Malkin, for example, charges that Obama's diplomacy has "solidified his place in the international view as the great appeaser and the groveler in chief." But such critiques miss their mark; the historical record makes clear that dialogue and compromise - not intimidation and intransigence - are critical to resolving longstanding disputes. The great geopolitical breakthroughs of recent decades came not when one side coerced the other into submission, but through bold diplomatic gambits - Richard Nixon and Mao Zedong in Beijing, Anwar Sadat and Menachem Begin in Jerusalem, Ronald Reagan and Mikhail Gorbachev in Reykjavik. It is also the case that the zones of peace that exist in the world today have been built around discrete episodes of rapprochement among bitter rivals. At the end of the nineteenth century, the United States and Great Britain brought to a close over a century of animosity. Several years of persistent diplomacy resolved outstanding disputes and promoted the onset of Anglo-American amity. That amity then provided a solid foundation for the transatlantic community's many successes during the past century, especially after Franco-German rapprochement cleared the way for a democratic Europe at peace with itself. In similar fashion, peace and stability in South America have been anchored by friendship between Brazil and Argentina, a coupling that began in 1979 and then deepened over the course of the 1980s. And rapprochement between Indonesia and Malaysia has been a vital precondition for the relative stability enjoyed in Southeast Asia since the 1970s. Peace is too often taken for granted. It should not be. That the United States and Canada share a long border that is effectively undefended on either side is - in historical and comparative perspective - both a miracle and a blessing. And it is not by accident that the U.S.-Canadian frontier is free of tank traps and fortifications. 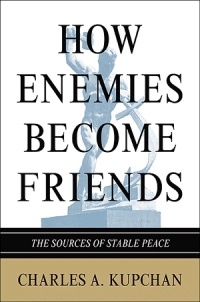 Stable peace is the result of assiduous diplomatic engagement among the United States, Britain, France, and Canada that succeeded in turning former enemies into lasting friends. The lesson for our time is clear. The diplomats should keep at it. Charles A. Kupchan is Professor of International Affairs at Georgetown University and Whitney Shepardson Senior Fellow at the Council on Foreign Relations. He is the author of How Enemies Become Friends: The Sources of Stable Peace (Princeton, 2010), and No One's World: The West, the Rising Rest, and the Coming Global Turn (Oxford, 2012). 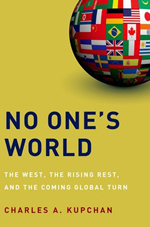 "No One's World makes a bold claim that we are seeing not just a shift to a more multipolar world, but the emergence of "multiple modernities" in which Western values are no longer dominant. This is a debatable point, but one that is cogently argued by one of the keenest observers of international politics." "Charles Kupchan provides a refreshingly sober, clear-eyed, and controversial take on what the emerging world might really look like. 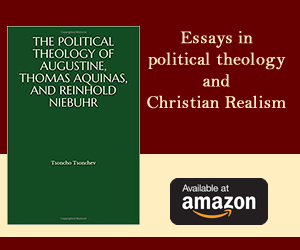 You don't have to agree with all his prescriptions, but his well-informed and crisply-written analysis of the historical forces that have shaped today's world and what they mean for tomorrow is a valuable contribution on the most important topic of our time."